FINNISH IMMIGRANTS KNEW A good thing when they saw it. They settled the Brule River Valley more than 100 years ago. Look at the names of the country road signs: Tikkanen, Leppella, Hakkinen, Lakki and, of course, Johnson. There are so many Johnsons in the Brule area some persons do not have to change their names after being married. The history and heritage of this river impresses me as much as the outstanding fishing. The entire Brule River is within a state forest-never to be dammed or otherwise altered. Native Americans and fur traders traveled the Brule up to the Brule/St.Croix portage down the St. Croix and then to the Mississippi. The landowners along the lower Brule are aware of this valuable resource. Virtually every foot of this part of the river is accessible to all wading anglers. Along the river there. are no signs, no yelling and no problems. Five former presidents fished it and are part of the Brule's crowded history. Lake Superior was first stocked with steelhead in the late 1800s and within a few years they had strayed to almost all tributaries and established naturalized populations. The Brule was first planted with steelhead in 1892. In May of 1921, The Wisconsin Conservationist reported the Brule was full of large rainbows (steelhead) from 5 to 20 pounds. Indeed they have withstood the test of time. The Brule has developed its own genetic strain of steelhead.These fish are more stocky than their relatives on the North Shore, which tend to be long and lean. These differences aside, they are typical Lake Superior steelhead, very wild and very athletic. Many people I have talked with assume that all Lake Superior steelhead are hatchery fish, while their beloved brown trout are more "wild." Excuse me, but didn't the brown trout come from another continent? Steelhead were transplanted from the West Coast of the United States while the brown trout traveled here from Europe. The Brule fishes well spring and fall. Spring is spawning season for steelhead. The fish are colorful. Males have bright red gill plates and broad red stripes. The females are full of eggs, ready to be deposited into the Brule gravel beds. The fish are very visible this time of year. The males fight each other constantly while on the gravel. It's survival of the fittest and the strongest male gets the chance to spawn with many females. Fall on the Brule is magical, the colors are indescribable. The steelhead are months away from spawning. They are chrome silver and at their best. Water temperatures in September and early October are often in the mid-50s so these chrome missiles perform at their peak.The September steelhead in the Brule are regarded as one of the finest fighting steelhead anywhere. October and November fish can be extremely active as well. November steelhead usually show some color. The males show a red stripe, some mature males have the classic double red stripes. Gordon MacQuarrie, outdoor editor for the Milwaukee journal from 1936 to 1956, whose work appeared in Field & Stream as well, wrote several stories based on his experiences on the Brule in the 1930s and 1940s. Many of his landmarks and fishing spots remain unchanged today. kinds of people into one a Brule Steelheader. throughout the Brule valley-one of the most important and unique is the camraderie that exists between anglers who have never met. Upon arriving at a popular run or hole already occupied, the proper angler will ask, "Do you mind if I fish through, behind you?" The answer usually is a resounding, "Go right ahead!" Then, there are the old timers. The Brule seems to have an inordinate number of old timers. These guys are in their 70s, 80s, and some still fish the Brule into their 90s. These anglers have seen the best, the worst and the ugliest of the last 50, 60 and 70 years of steelhead fishing on the Brule. I always slow down my fishing pace to say hi or to listen to a story from one of these special anglers. Milwaukee Mike was an avid Brule steelheader. He traveled from Milwaukee every year to fish his beloved Brule. I have asked him many times for permission to fish through Dead End Run behind him. Today his ashes are in a small monument that sits on top of the ridge along the opposite hank of Dead End Run. The ridge rises up directly from the river's edge and the monument is visible while fishing the top of the run. No more conversations with Mike. Bnt he is still there. 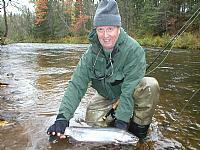 Trout Camp is a steelhcad camp located deep within the woods of the Brule area. This camp is occupied by a group of hard-core fly fishers (including myself), All of us are enchanted by steelhead. Tales around the campfire in the evening are similar in nature, differentiated only by the teller or victim as the case may he. Old SapAss (Guy Parkin) strolled into camp and sat near the camp fire one night several years ago. He told us about his evening of fishing. "I hooked a big steelhead at the top of Grass Eddy. It jumped about seven or eight times then took off for the tailout of the run. It jumped once more about four feet into the air and got off." Without any remorse Old SapAss said, "Thank you God for letting that fish get off! I did not want to chase that fish any further!" Anyone who fishes the Brule regularly has similar experiences with these torpedoes. One memorable fish took my fly, then performed several `greyhound' leaps to the top of the run. In an instant the fish turned downstream and catapulted itself into the air, crashing through an overhanging alder tree. It then landed on one of the many red clay banks found along the Brule. The fish thrashed violently on the clay. Soon the thrashing paid off and back into the water it went. All of this happened in 10 seconds. The chrome silver male steelhcad raced downstream (with me behind) to the next run. It then tore through that run and that's when I landed the 26 1/2-inch male, 100 yards downstream of the hole where it was hooked. Several years ago there were stories about the tributaries of Lake Michigan circulating among many western Lake Superior anglers. Tales of 20-to 30-fish days were common. Most of the action was coming from the eastern Wisconsin rivers (Root River, Kewaunee River). One of the best anecdotes was from a fly angler who, while fishing the Root, surccessfully hooked and landed several steelhead that were holding behind a refrigerator. Another good friend and Trout Camp member Sven Lonkila (Greg Lonke), put our Brule River fishery into perspective. While sitting at the campfire one night, Sven spoke up: "Boys, those guys fish the Root to fill their ego, you fish the Brule to fill your soul."